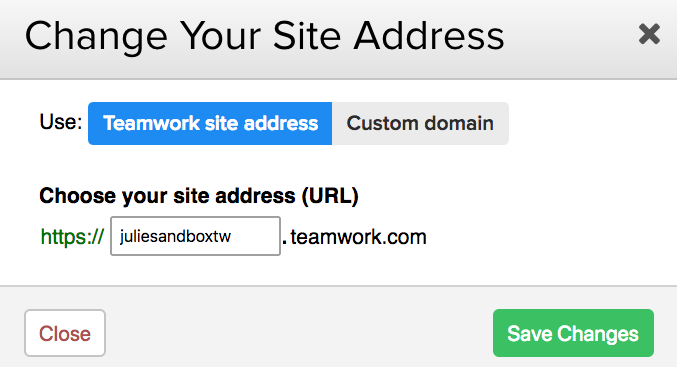 Within Teamwork Projects, you can change the address of your site (usually yourcompany.teamwork.com) in your site settings. Click on your profile icon in the top right corner of your site, and choose Settings from the dropdown menu. In the Settings area, go to the General tab. You will see a section for Site Address. Click on the edit link under the current site address to update it. You have the option to update the current teamwork.com site address, or add a custom domain. Note: If you see a message that the URL is currently unavailable when you try to change it, that means it's in use for another site. If the site is no longer active or if you are the owner of the site using the address, you can get in touch with support@teamwork.com and we will help you update it. Any old links within emails will redirect to the new URL.